One New replacement John Deere Tractor Clutch Drive Disc that fits Farm Tractor Model 60. With 20 Teeth and 6 Splines. Our processing system is automated. 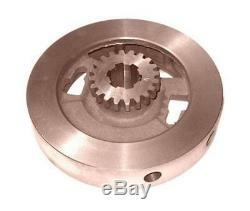 The item "A4391R Clutch Drive Disc Made To Fit John Deere Model 60" is in sale since Friday, June 24, 2011. This item is in the category "Business & Industrial\Heavy Equipment Parts & Accs\Tractor Parts". The seller is "reliableaftermarketpartsinc" and is located in Williamston, Michigan. This item can be shipped worldwide.